The new MacBooks have many of the features the MacBook Pros had such as the built-in iSight camera, Front Row media center, Mag Safe power adaptor, FireWire, WiFi 802.11g, and Bluetooth. The white model is available in 1.83GHz for $1,099 and 2.0GHz for $1,299. The slightly higher-end black MacBook also has 2.0GHz processor, but costs $1,499 because of an extra 20GB of storage. 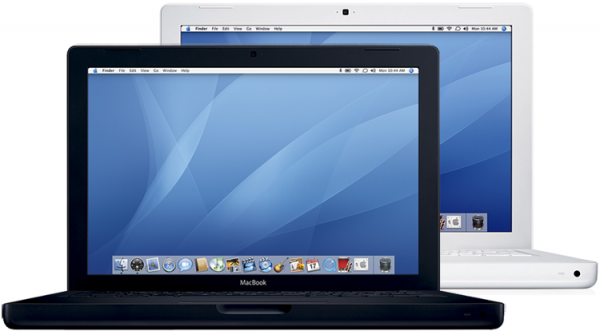 MacBooks are customizable and are available 512MB-2GB RAM, 60-120GB HDD, 4x-8x DVDÂ±RW Drive, and a 64MB Intel Video Card. If you do plan to order one you are in luck, Apple has stated that orders placed today will be delivered by the end of the week. Great machine. Just make sure to get a MacBook pro if you’re looking forward to using CoreImage apps (like ChocoFlop or Livequartz). In this case a good GPU is crucial, and that’s the main difference between the pro and the plain macbook.